The internet is rife with sham web sites that impersonate legitimate companies, created by scammers who hope to trick consumers into giving out their personal information. When a consumer is fooled, the scammers run all kinds of cons to get money from their targeted victims. So when the news of a scam that targeted AOL customers came to us — a fraud that we hadn’t heard of before — we wanted to take a closer look. The reader, who asked to remain anonymous, said he and his wife have been AOL customers for as long as they can remember. The husband, who we’ll call Steve, stores lots of emails on the AOL server. Because his inbox limits what he can save in one folder, he uses several dozen additional folders for recordkeeping. His wife does, too. One day last month, Steve logged in to his AOL email account and saw half of those folders were missing. Unsure of how to solve the problem on his own, he searched online to find a number for AOL tech support. He found one, and he called. He said a man answered the phone and identified himself as Peter William. Steve explained the problem to William, who said the company has been getting lots of calls from users who said they had the same problem. The rep told Steve to log in to a remote access program so the rep could have access to Steve’s computer to run some diagnostics. The remote access program the rep directed Steve to is a legit one, by the way, and can be used by virtually anyone to allow anyone to have long-distance access to their computer. But the rep did offer a solution, touting a third-party vendor recommended by AOL for such problems. The rep gave Steve the phone number for an outfit called Online Support Network, and then he offered to connect him. Online Support Network’s rep called himself Alex Hale, Steve said. Hale asked Steve to give him access to his machine using the same remote access program. After a few moments of cruising Steve’s machine, this rep, too, found that Steve had 15 unauthorized users on his network. A screen shot of a non-AOL web site that uses the company’s logo. The vendor said he could fix the problems for $300. And for another $200, Steve would get a two-year license. Unbeknownst to Steve, at the same time, his wife was also trying to reach AOL tech support. She found the same help number through her own internet search, and her supposed AOL rep also recommended a third-party vendor for her network problem: Online Support Network. Before she went any further, she tried to reach Steve, who was still on the phone with Online Support Network. She instead spoke to Steve’s in-house tech guy, who had been monitoring Steve’s conversations. He knew something wasn’t right and he told Steve to get off the phone. Steve, his wife and the tech guy compared notes, and they were suspicious. Steve’s tech guy recommended he run his anti-virus software. Lo and behold, Steve’s missing folders reappeared and everything was back to normal. Same for Steve’s wife’s machine. But Steve still had concerns about what appeared to be a fraud. After all that, Steve got in touch with the real AOL. The rep said the company was aware of fake tech support numbers circulating online and that the company was working on it, Steve said. While AOL isn’t as popular as it once was, it still has lots of customers, so we were surprised we hadn’t heard of this AOL-specific fraud before. We couldn’t find any consumer warnings online, but we did find several web sites that impersonated AOL tech support. Some pages were produced by legit tech help companies, but they seemed to mislead consumers into thinking they represented the real AOL. Some even used AOL logos. Others were one-page jobs that didn’t seem to represent any authentic tech help company. Trying a different kind of search, we typed “AOL email help” using the AOL search function. It wasn’t much better. While the “featured” listing is the real AOL, the five following listings were ads for companies that, when you click, bring you to tech help pages from third party companies. Some clearly state that they’re not affiliated with any particular email provider, but others were not so transparent. You’d have to page down in your search and pass those advertised listings to get to links to for real AOL. We also found a now defunct scam in which customers were tricked a phishing page — one that made it look like the customer was on the real AOL page — led customers to call a fake tech support number. And of course, the phony tech guy can fix a user’s problem — for a price. Another scam. Such fake or misleading web sites are nothing new, and AOL isn’t the only corporate victim. We encountered one when we did a series of stories about scammers who used MoneyPak cards to steal money from consumers. We learned there was at least one web site representing that it was a MoneyPak help site, but it had no relation to the real company and it actually stole money from consumers who called for help. The company behind the real MoneyPak, Green Dot, went to court after we reported the fake site, and it was able to get the site taken down. We wanted to know more about what AOL was doing to protect and inform its customers, so we reached out to the company. We tried to reach Online Support Network, but we only got a computer-generated voice mail message that didn’t identify the company by name. We also couldn’t find any web site for the company, and the phone number didn’t come up in any public records searches. When AOL got back to us, it said aggressively polices and takes action against tech support scams of this type, but it hadn’t heard this complaint before. That’s interesting, because Steve said he spoke to a rep who logged his complaint. “We will investigate now that it has been brought to our attention,” a spokeswoman said. We asked if reader email folders can seem to disappear. 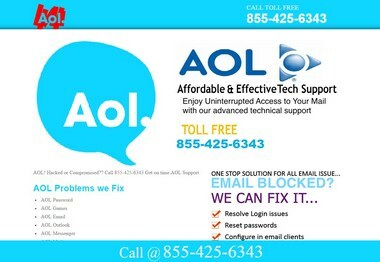 AOL agreed that its one of many companies that are battling tech support scammers, and it has warned its customers. When an issue is reported, AOL’s legal team may take legal action depending on the specifics, such as misappropriation of AOL trademarks, misleading consumers into believing the service is provided, affiliated with, sponsored or endorsed by AOL, the spokeswoman said. Additionally, the company crawls the internet looking for use of AOL trademarks and brands so it can take action against fraudulent or infringing use, she said. We shared Steve’s experience with Mitch Feather of Creative Associates, a Madison-based cybersecurity and infrastructure consulting firm. He said consumer awareness is key. He recommends that before you have a crisis, you should create a list of verified contact numbers for all your services. This way you won’t jump to a bad source in an emergency. Feather said legit help companies often want to use remote access programs to check out your machine’s problems. Plus, Feather said, he’s never experienced a large company support line that wanted to transfer a call to a third party for broader support. If something doesn’t sound right, step back and think before you take action. “Most companies are extremely receptive to such calls because the last thing they want is a scam using their good name,” Feather said.